Creature Feature: Pill Bugs. Garden pests or heroes? Pill bugs, aka rollie pollies are pretty hard workers in the garden! However, they can often seem like quite the pest. If you feel that way then you’re right: This little land crustacean can be both a pest and beneficial depending on the season and weather conditions. 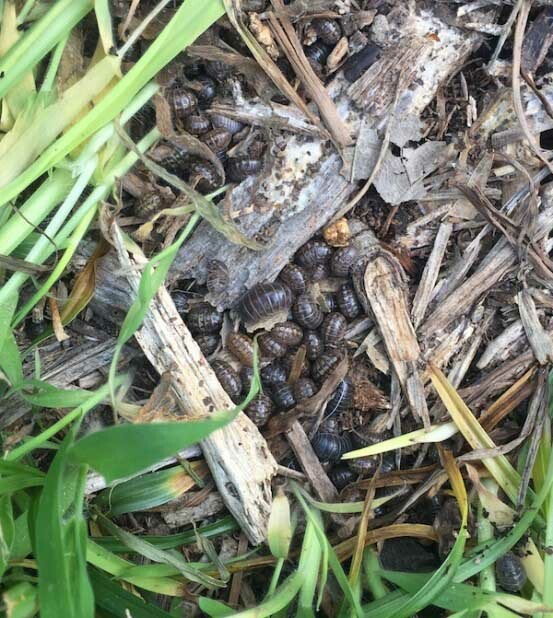 When the weather is cool and wet with excess rainfall, pill bug populations can explode, causing quite a bit of damage to plants. Otherwise, pill bugs are nature’s clean-up crew. They voraciously eat rotting plants and dung, breaking down organic decaying matter (detritus). However, when they become overpopulated, there simply isn’t enough detritus to feed them all and they’ll start going for your green plants. They’ll eat new flowers and flower buds as well as soft new foliage on your bedding plants and vegetables. So frustrating! The pill bug, Armadillidium vulgare, is a crustacean related to the arachnipod. They have a hard, segmented exoskeleton that is light to dark grey, and seven pairs of legs. They sure do look like tiny armadillos! When on the defensive, they roll into a little ball to protect themselves. They prefer very moist, dark areas of the garden, which is why they are most prevalent after a rain especially under pots and rocks. Keeping your garden clear of their favorite habitat is the best way to keep populations of pill bugs under control. Keep beds clear of heavy decaying leaf and plant litter. Move woodpiles and other nesting areas away from your garden. Leave 8- to 12-inches of space between mulch and the foundation of your home. Also check for any leaking outdoor faucets that might leave the soil continuously moist. When rainfall is heavy and temperatures cool it can be hard to totally prevent over-populations of pill bugs. Diatomaceous earth can be spread around the soil to help control pill bugs if they get out of control. Natural pesticides like spinosad or horticultural oils can be carefully applied to the plants they are feeding on if necessary.